Breaking in your pointe shoes is an important step in preparing your shoes to wear for class. There are several benefits to the dancer and the shoe that will assist in better function and comfort. I Need to Sew My Own Ribbons?? Once a dancer has been properly fitted in pointe shoes, the next step is to prepare them for wear. Because dancers feet are shaped differently, and because dancers tend to have specific methods of sewing their ribbons and elastics, pointe shoes come without the ribbons or elastic pre-attached. If you are getting your first pair of pointe shoes, this may come as a big surprise to you! However, rest assured that the time and attention needed to sew your own ribbons and elastic on your pointe shoes, just how you need them, is well worth the effort. What Will I Be Doing, Exactly? Ribbons and elastics should be sewn in such a way that they help the shoe to hug the dancers arch. This ensures that the mechanisms of support in the shoe can actually do their job! Because no two feet are the same, it is best for each dancer to sew her shoe in accordance with the shape of her own foot. The following instructions I have put together are Ballet 5:8’s recommended starting point for any dancer. Many dancers alter the way they sew their shoes in order to best suit their own feet and ankles (I will give some examples throughout). That being said, it is always crucial to check these kinds of changes with your teacher and ask if it is safe for you and how to do it correctly. Most ribbon comes pre-cut in about a 6-foot length. Dancers will first need to cut this piece of ribbon in half, one for each shoe. The ribbons should be attached to the shoe at the highest point in the arch of the dancers foot. To do this, the dancer can place the pointe shoe on her foot, take a pencil and make a line on the inside of her shoe where the highest point of her arch is located. Dancers should also be sure to mark the placement of their ribbons for each foot, because each foot may be different! Ribbons should be placed on the shoe by lining up the center of the ribbon with the pencil park on the inside of the shoe, with the shiny side of the ribbon facing out. The dancer can then sew the ribbon to the inside of the shoe on each side with a whip stich around the sides and across the top. Be sure to sew through the canvas, but not through to the satin on the other side of the shoe. Dancers should also be careful not to sew into the drawstring at the top. Sewing the ribbon on each shoe as one piece is helpful, particularly if one side of the ribbons becomes unattached. This will keep the ribbon in the shoe until the dancer can reattach it later! Some dancers like to sew 2 separate ribbons onto each shoe using the same method for placement. Some dancers also like to buy or make ribbon with elastic sewn into it. This gives the ribbon a little “give” so that while the ankle is moving between a flexed and pointed position, and thus changing in size, the ribbon can adjust. There is some variety in the method of sewing elastics, however in general the elastics should be sewn onto the side of the shoe towards the back so that the elastic lies under each anklebone. The placement can again be marked using a pencil and the same whip stich can be used. The shoe should be marked for placement on each side of the ankle, as the anklebones are slightly different on each side of the foot. The elastic should be just tight enough to offer support, but not so tight that it will cause irritation to the soft tissue of the ankle or hinder important blow flow that occurs on the top of the foot. Some students who have very flexible ankles find it helpful to sew 2 pieces of elastics on to each shoe that “criss-cross” for added support. Talk to your pointe teacher if you would like to know how to sew them this way! Students should never dance in their pointe shoes with out ribbons. If they are correctly placed, the ribbons should do most of the work in holding your shoe. They take the brunt of the work in keeping the insole of the shoe next to the bottom of the foot so that the shoe can work properly. Because students are still developing the strength in their feet, it is not safe for them to dance with only elastics on their shoes. Additionally, when a dancer does not use ribbon, the elastic usually needs to be sewn on tighter to hold the shoe. This can cause irritation to the soft tissue at the top of the ankle and limit the blow flow into the ankles and foot that occurs there. The ribbons over time will start to fray, so be sure to treat the end of the ribbon with some nail polish. You can also hold the ribbon close to a flame of a candle to melt the fibers at the end, however DO NOT DO THIS WITHOUT PARENT SUPERVISION!! Now that our pointe shoes are ready for dancing, in the next blog post we will discuss how to make them last longer. Dancing on pointe is one of the most exciting achievements that an intermediate ballet student looks forward to - so naturally, there is a lot of anticipation among students and parents for the day when students are allowed to begin dancing on pointe! However, putting a dancer on pointe too young or too soon can cause lasting damage to their feet and ankles. So when is the best time for a dancer to begin dancing on pointe? Though this may not be exactly what you wanted to hear, there is not a simple answer to this question! There are many, many factors that need to be taken into careful consideration when determining the readiness of a dancer for pointe work. For instance, many parents ask if there is certain age when students are allowed to begin dancing on pointe. Age does certainly play a role; however, because children develop at different rates and have varying amounts of training at a particular age, it is not appropriate for all dancers to begin at the same age. 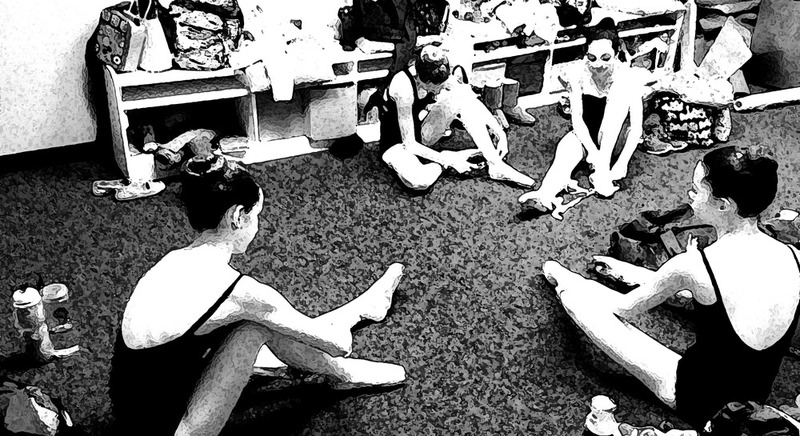 Generally, dancers begin pointe training between ages 11-14. Before a dancer can begin working on pointe, her ankle must gain enough flexibility to stand upright on pointe. Likewise, the foot and ankle must gain considerable strength in order to safely initiate the pointe work. At many schools, including our own here at Ballet 5:8, students are required to attend a “pre-pointe” class for at least a year before applying to begin pointe. The focus of this class is to prepare the young dancer for pointe by executing specific exercises that increase crucial strength and flexibility of the foot and ankle. Good technique gained from attending regular classes is so crucial for dancers wanting to advance to pointe work! Technique class trains a dancers body how to do the steps correctly, so that their body is already strong and prepared to do the same movements on pointe. At Ballet 5:8 School of the Arts, we strongly believe in preparing our dancers and making sure that each student begins their pointe training at an appropriate time for that individual. Along with our pre-pointe class, dancers must pass a pre-pointe test, which assesses their overall strength, flexibility, and technique. If dancers haven't fully developed the needed proficiencies to safely begin pointe work, their instructor will recommend taking the pre-pointe class for another year. The wonderful news is that if a dancer does have good ankle flexibility, over all strength and a good understanding of ballet technique, the transition to working on pointe can be a safe and exciting one! Though it is sometimes difficult for dancers to wait until they are fully ready to begin training on pointe, the wait is well worth the positive experience it leads to. How do Ballerinas Dance on Their Toes? How do ballet dancers dance on their toes? In this post, Ballet Mistress Mrs. Lauren Ader-Cumpston explains.